Japan is a hive of freedom when it comes to having choices in exploring the great outdoors. There are places to suit everyone’s needs and tastes and many things to explore for anyone lucky enough to visit the Land of the Rising Sun. There are literally unlimited things to do in the Japanese outdoors, from participating in sports, to simply relaxing underneath the beauty of Japan’s natural wonders. There is quite possibly no easier way to experience the outdoors in Japan than to simply get outside and walk about. There are many places to explore, from city to rural areas. The country is also home to many mountains and hillsides ideal for hiking and climbing, providing access to some of the most beautiful visuals one could hope to see for themselves in the south-eastern Asian region. Kamikochi is one of the many places an enthusiastic outdoor explorer should not pass up on visiting. It’s a type of resort area located in the Japanese Alps and is often heralded as one of the most picturesque parts of Japan’s natural scenery. Due to weather conditions, Kamikochi is only accessible for half the year, normally ranging from mid to late April until the very mid of November, meaning the winter months make the area inaccessible. Basically, Kamikochi is a plateau, measuring in at an impressive length of 15 kilometers (9.3 miles) and a height of 1.5 kilometers (.93 miles) above sea level. It counts as part of the Chubu Sangaku National Park. 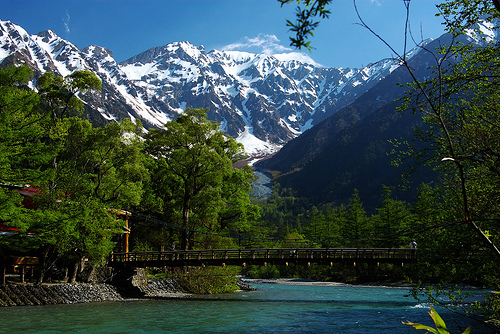 The center of Kamikochi holds the Kappa Bridge, from where different hiking trails split off to the surrounding mountains or down the valley below. Most of the trails found in the area don’t require any special equipment or experience to make use of as most of the landscape is flat and even. Some trails are only recommended for experienced hikers, especially since weather conditions might potentially turn dangerous for the less experienced, and it is generally advised to not wander alone in dangers of getting lost. There is also some wildlife to be seen at Kamikochi, predominantly during the fall, around the middle weeks of October. Monkeys climb around and with some luck some very colorful birds can be spotted in the vicinity, offering great opportunities for pictures to those with cameras. 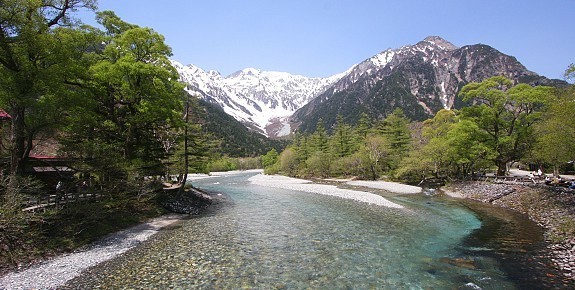 Kamikochi has been developed with the priority of preserving the state of nature in its vicinity and therefore is only accessible by bus or taxi, with privately owned cars being banned from the area. The surroundings include a handful of restaurants as well as shops.